When was the Moon Created? Does the Day Really Matter? Home Biblical Christian Articles Yah's Calendar When was the Moon Created? Does the Day Really Matter? The Creator’s Calendar is based on the Moon and the Sun, as specified in Scripture. As support for the true Calendar grows, so do the silly arguments against it. When was the Moon actually created and how does it affect its ability to be an accurate Heavenly timepiece? Can we honestly trust the wisdom and pattern set forth in Genesis? Let’s find out. In need of a fun rainy day activity to get the stir-crazy children out of the house, Alex and Sophia piled into their old station wagon and went with their parents to a big car factory to watch the assembly line and see how cars were made. The family passed large warehouses where pre-fabricated parts and wheels were stored. Entering the gigantic and quite technical car factory, they watched in awe as large robots and meticulous workers started with a few odd shaped parts and slowly but systematically assembled each piece to form a car. As each new part was put into place, Alex grew more anxious. His favorite part of all his toy cars and trucks were the rubbery wheels that made them speed across the kitchen floor. Alex asked his dad, “But where are the wheels? 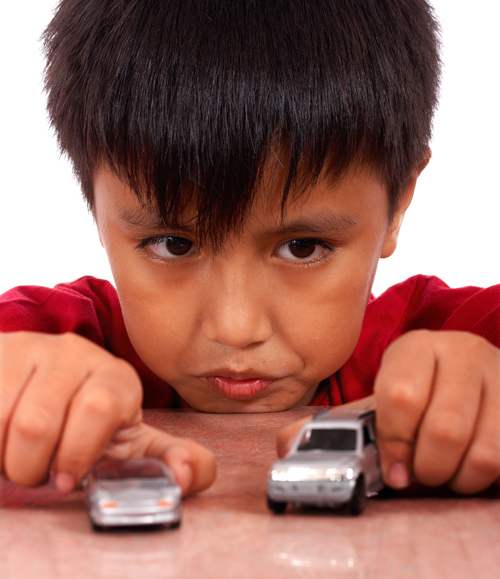 How will these cars ever go anywhere?” “Just be patient,” his dad responded. “The designers have a plan and specific timing for all the parts. I am sure they will be added when the time is right.” Alex was still not sure. The wheels were the most important part in his eyes. He eagerly urged his family to the end of the assembly line. Sophia and Alex both asked to be picked-up so they could get a better view over the solid guardrail at the end. There they were! Beautiful, shiny new cars were literally rolling off the assembly line…with wheels! “Wheels!” Alex exclaimed. He was quite relieved to see them finally. “And guess what?” their parents grinned. “That one is ours!” Alex and Sophia squealed with joy! How exciting to see their new car actually being made! They would remember this day forever. In this story, we see how Alex was apprehensive about trusting the designers. To him, the wheels needed to come first; however, the designers clearly had a plan and an order to the creation of the car. If earthly engineers can efficiently design and build a car, how much more can we trust our Heavenly Father’s plan and pattern laid out in the Creation week? 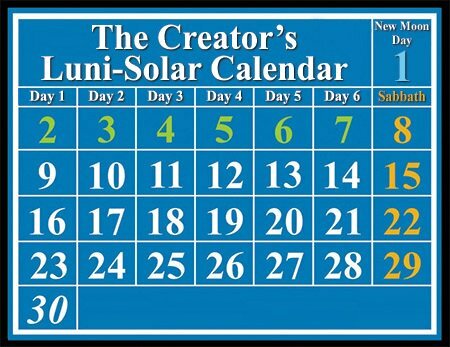 There is a popular argument against the Creator’s Lunar-Solar Calendar which suggests that since the Moon was not created, or at least ordained1, until the 4th day of Creation, it cannot play an integral role in the Creator’s Calendar, especially not in regard to the weekly cycle. While skeptics are quick to offer this supposition as "evidence" against the Lunar-Solar Calendar, a closer examination will show the fallacy of this reasoning. Our Heavenly Father is the Creator of order, reason, and the governing laws of our incredible Universe. We see the wisdom in His pattern set forth in the Creation week of Genesis. He began with nothing and created everything in the right time and in the right order. He would not have created Adam and Eve on the first day because they were to, “Be fruitful and multiply and fill the earth and subdue it, and have dominion over the fish of the sea and over the birds of the heavens and over every living thing that moves on the earth.” There was nothing for them to have dominion over on the first day; the Earth was without form and void. So naturally, they were created after their place of habitation was created, likewise with the plants and animals that were to also grow and reproduce. Let us examine the order Yahuwah created in Days 1, 2, and 3 and see how they relate to Days 4, 5, and 6. Day 1: Created Light – darkness separated. First Day and Night. Day 2: Separated the waters that covered the Earth (created the firmament). Day 3: Gathered the waters on Earth into one place, creating dry land; populated the land with grass and fruit-baring plants and trees. At this point in Creation, it seems Earth was ready to sustain animal life. In His infinite wisdom, Yahuwah continued fine-tuning our amazing world. Day 5: He filled the seas abundantly with life, and filled the skies with every winged bird. Notice how on Day 5 He populated what He divided on Day 2 of Creation. Day 6: On the final Day of Creation, Yahuwah filled the dry land with living creatures and then He created Man and Woman. They were to be fruitful and multiply and take care of His Creation. Notice how on Day 6 He populated the foundation that He laid on Day 3. On Days 1, 2, and 3, the Creator laid His foundation. On Days 4, 5, and 6, He populated the foundation in the same order in which He established it. "In the beginning Elohim created the heavens​ and the earth." (Genesis 1:1) (including t​he sun, moon, and stars, which reside in the heavens). The word "created" here is bara (H1254). Its use in Genesis 1 seems to denote creating something in an absolute sense, as in from nothing. This word is only used 5 time in Genesis 1: (1) "...created the heavens and the earth." (2) "...created great whales..." (3) "...created man in His own image..." (4) "...created He him; male and female (5) created He them." The other word translated as "made" throughout Genesis is asah (H6213). This word means "to do or make, in the broadest sense and widest application: - accomplish, advance, appoint, …"2 This word, in the first chapter of Genesis, seems to signify advancing upon something already created, or appointing something. For example: Yahuwah "made" (H6213) the firmament by separating the waters that were already there; He "made" (H6213) two great lights." Psalms 104, when restating what appears to be a chronological account of the Creation week, uses exactly the same word used by Moses in Genesis 1:16; only, here is translated as "appointed." ​​This understanding illuminates Genesis 1:1 and the first day of Creation (pun intended). "Let there be light" on "Day 1" was the lighting of the sun, which clarifies how there could be literal days (light/darkness cycle) before "Day 4." The sun being lit on "Day 1" explains how there was day (H3117-yom: "to be hot; a day") and night before "Day 4." The sun, moon, and stars were simply "appointed" their divine calendrical role on "Day 4." However, they were "created" (bara - H1254) in the beginning where it is stated that "Elohim created the heavens..." (Genesis 1:1). Ironically, people have no problem using a solar calendar even though the sun was not ordained until the 4th day. Why would the moon be any less functional as a calendar, especially in light of Psalms 104:19? This argument is nothing more than hypocrisy. The whole dispute loses even more credibility as it has been established from Scripture that both the Sun and Moon were created in Genesis 1:1. At first glance, some might see merit in the argument that the Moon was not ordained on the first day so it cannot be used for His Calendar. However, Scripture illustrates something quite different. The Moon was and is still clearly established for use in His Holy Assemblies, worship times, and therefore integral in His Calendar. The Moon stands as an immovable calendar in the heavens. Praise Yahuwah, now and forever, for His perfect plan, His wisdom, His Providence, and for His beautiful perpetual Calendar in the sky! With no “new moon” day before the first day of Creation, how could the moon have been in the correct phase for the first Sabbath and all Sabbaths to follow? 1 We add the caveat “or ordained” because there is room in the Hebrew text both contextually and grammatically to postulate that the Sun and Moon were included in the call for Light on day 1 of Creation and they were rather ordained to their specific place and order on day 4 of Creation. 3 Numbers 29:6 besides the burnt offering with its grain offering for the New Moon, the regular burnt offering with its grain offering, and their drink offerings, according to their ordinance, as a sweet aroma, an offering made by fire to Yahuwah. 2 Kings 4:23 So he said, "Why are you going to him today? It is neither the New Moon nor the Sabbath." And she said, "It is well." Psalms 81:3 Blow the trumpet at the time of the New Moon, At the full moon, on our solemn feast day. Isaiah 66:23 And it shall come to pass That from one New Moon to another, And from one Sabbath to another, All flesh shall come to worship before Me," says Yahuwah. Ezekiel 46:1 'Thus says Yahuwah Elohim: "The gateway of the inner court that faces toward the east shall be shut the six working days; but on the Sabbath it shall be opened, and on the day of the New Moon it shall be opened. Ezekiel 46:6 On the day of the New Moon it shall be a young bull without blemish, six lambs, and a ram; they shall be without blemish. Hosea 5:7 They have dealt treacherously with Yahuwah, For they have begotten pagan children. Now a New Moon shall devour them and their heritage.